If you are a mom-to-be, you may feel overwhelmed with all the things out there that promise to make your baby registry checklist complete. It seems like every website has dozens of different items that will make your baby sleep better, eat better and basically grow up to be a more complete human being. Never fear—what you actually need is way less than what people tell you to buy. Whether you’re a new mom, a second (or third, fourth, etc!) time mom, having twins or if you are a minimalist mama, this baby registry checklist has all the essentials you’ll need. Ah, new moms. It was not that long ago that I was pouring over checklist after baby registry checklist trying to discern what on Earth my sweet baby girl would actually need. I definitely overbought and purchased things I shouldn’t have, but I thought it would be best to overbuy than be without at 3 am. On this side of parenthood, I know that I should have just relied on my instincts! :) Here are my must-have baby registry checklist items for new mamas. Like most new moms, I am assuming you don’t have a secret crib stashed away in your spare room. Here’s what I recommend you add to your baby registry checklist as a new mom, furniture-wise. Crib. There are so many gorgeous cribs out there on the market, but I recommend something neutral like this pretty modern crib. It will be timeless and great for any type of nursery you want to put together. Bassinet. Whether you choose to use a bassinet and keep baby in your room is totally up to you, but if you would prefer to keep baby close for the first few months, I like this foldable bassinet. It’s perfect for travel and also has a rocking feature baby will love. Dresser. In case you haven’t realized, baby clothes are tiny! If you have room, go for a full dresser, but if you are like many of us, you will want a slightly smaller version like this nursery-friendly dresser. Changing table. If you purchase a dresser, you won’t need a separate changing table, but if you opt to keep baby’s clothes in a closet, you might appreciate having a changing table to use for your many, many diaper changes. Baby rocker. Truly, this may be the most important item on your list! I promise you, you will want a comfy place to rock your little one. Whether you bottle feed or breastfeed, I HIGHLY recommend finding something with arms like this chair for your baby registry checklist so you have a place to rest when you need it! Outside of furniture, here are all the random bits and pieces I recommend you add to your baby registry checklist. Diaper bag. Yes, a diaper bag should be on the top of your list…I PROMISE you will leave the house someday! There are so many cute options out there, but I highly implore you to buy a backpack version (your back will thank you!) and also one in a neutral color like this diaper bag so that your husband has no excuses not to carry it around, too (haha). Travel changing pad. You’ll do lots and lots of diaper changes. However, I guarantee you that you will not want to use the public restroom changing table, especially without something underneath your sweet baby. Grab this changing pad, and purchase some of these disposable changing pads to put underneath and keep it all sanitary! Diaper pail. You’ll want somewhere to wrangle all those stinky diapers. This is the BEST diaper pail out there in my opinion! I’d also recommend you grab some of these bags to put the stinky diapers into before tossing them in the trash. Sophie the giraffe. There’s a reason every single baby in the world has a Sophie—she’s amazing! Trust me, you’ll want one of these on hand once baby arrives. Car seat and stroller. You’ll have to get baby home from the hospital somehow! This car seat clicks right into the stroller—no unstrapping your infant necessary. Car seat cover. The genius part of this car seat cover is that it also works perfectly as a breastfeeding cover, shopping cart cover and a stylish scarf. Baby monitor. I love having a video baby monitor because there are times you need to see your baby with your own eyes. This video monitor is a great one to add to your baby registry checklist. Bathtub. Your little one will need plenty of baths. This tub comes with a handy sling that keeps your infant comfy. Burp cloths. The spit up is real! Burp cloths will get used day in and day out once baby arrives. This set of burp cloths is cute and generously sized for maximum coverage. Baby carrier. Carrying two babies is a whole new ball game. This carrier is perfect for either toddlers or your young infant. Double stroller. It’s much easier to push one stroller with two babies than two strollers! This double stroller is stylish and safe for your little ones. Two camera baby monitor. Chances are you will want to keep an eye on both of your little ones. A monitor with two cameras will let you view both children at once. White noise machine. You will definitely need something to cover up the sounds of each child or they will keep each other up all day and night! Two babies mean double the fun! But, it also means double the stuff. While a general rule can be to take everything and times it by two, here are some items that will be specifically helpful for twin mamas to add to their baby registry checklist. My breast friend. Even if you aren’t planning on nursing, this twin pillow can help you hold two babies at once. Twin center. There are few things you might want more than a safe place to lay both your babies down in. Use this portable twin bed to care for them both. Snap and go stroller frame. Two babes equals two car seats. There are few double strollers that will hold two infants, so use this clever stroller frame instead. Lastly, for you minimalist parents, if you are wondering what the absolute essentials are, this is what you need to add to your baby registry essential checklist. Pack and play. This serves as an acceptable place for baby to play and sleep. Plus, pack and plays are totally portable and can be folded easily when you want to put it away. Sound machine. If you want a cheap and reliable audio baby monitor, this is the one! It’s got great reviews and is the one I personally have used for 15 months now. Onesies. These plain, white body suits are a staple every baby needs for the first few months. You will dress your baby to sleep, eat and play in these, so stock up! Cloth diapers. If you would like to try cloth diapering, this is what you need to start with. While there are many other items you can add to your baby registry checklist, these essentials will help you get started and build a safe space for your little one. 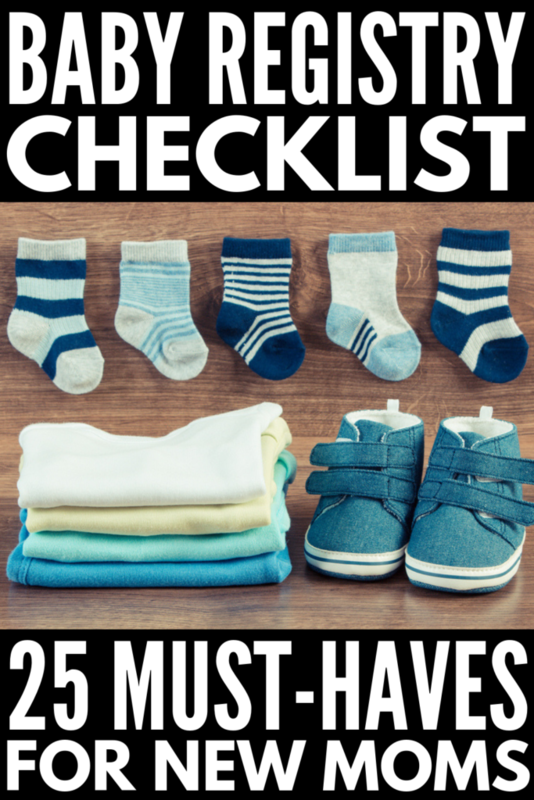 If you found this baby registry essentials checklist helpful, please share this post on Pinterest!